Christmas shopping may be high on everyone’s to-do list but if you’re looking for a little down time between the hustle and bustle of the holidays, a mini road trip could be just the ticket. A short jaunt up the I-5 is the perfect winter wonderland spring board for singles, couples and families. The friendly town of Tenino boasts a chocolatier, quaint shops and an experience-based winery. Wolf Haven and the quintessential train ride of the season—The Polar Express—await adventure-seekers a little further east. Exit 88 is your gateway to all this and more. Since 2014 Terril and Andrea Keary, owners of Scatter Creek Winery, have been the unofficial visitor center inside their 4,000 square-foot in-town winery and tasting room. What began as a hobby for Terril out of their garage in 2004 has turned into a cozy and welcoming gathering spot with a loyal following of wine club members that come from as far north at Everson, Washington and south into Portland, Oregon and beyond. At 1,500 cases a year, Scatter Creek is still boutique but their offerings are many and varied. This time of year the list of limited edition wines include their seasonal white blend Peach Breeze Spiced and red blend Holidaze Berry Select. Both come bottled with directions to serve warm by simmering in a crock pot—the perfect holiday gathering wines to enjoy with family and friends. Although their port selection Koko Indulgence is available year-round, it’s also a Christmastime favorite. Open seven days a week, Scatter Creek always has something going on including mini vintage or glamour photo shoots with an area photographer; bunco night complete with wine and appetizers; wine and yoga; and tailgate parties with the Tenino 12. New for Scatter Creek is their Wine-Bulance; a wine delivery service that covers adjacent counties such as Lewis, Mason and Pierce with the opportunity to expand based on popularity. Just place a minimum three bottle order and the Wine-Bulance will show up at your doorstep on a designated day to cure what ails you. Speaking of ale, look for Scatter Creek to become Scatter Creek Winery & Brewery in the Spring of 2017 showcasing six rotating taps. 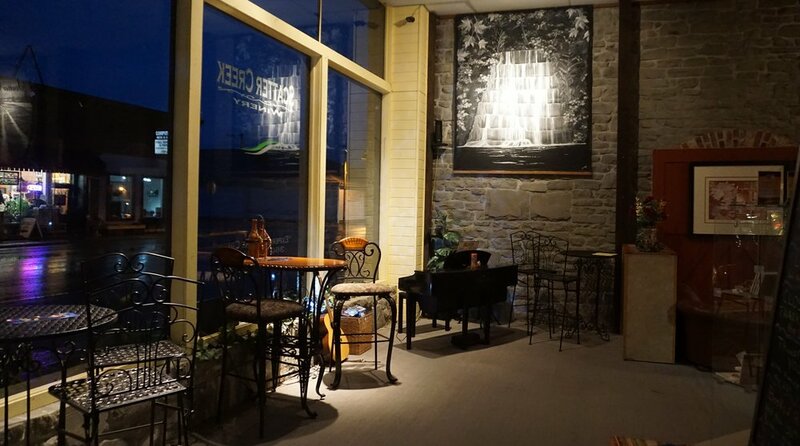 In addition to being an unpretentious and welcoming winery, Scatter Creek loves to partner with local businesses. They feature smoked meats and cheeses from Johnson Meats in Thurston County on their appetizer platter and the guacamole and chips basket—perfect for two—is sourced from Don Juan’s Mexican Kitchen steps from the tasting room. But my favorite has to be the Wine and Chocolate Pairing Experience for Two. At $40, it’s a decadent tour of five wines thoughtfully matched with five different chocolates from family-owned Aunt Kate’s Chocolates. Also found along Sussex Avenue, Aunt Kate’s features Scatter Creek’s Fire of the Knight syrah/zinfandel blend in their wine truffles. Aside from Aunt Kate’s, there’s Iron Works Boutique and More, Cousins Antiques & Collectibles, Sandstone Distillery and Sandstone Café. For a little girl time, family time or just the two of you, an overnight near Scatter Creek Winery is an ideal home base to enjoy craft wines and uncover all their backyard has to offer. Scatter Creek Winery is located at 237 Sussex Ave. W., Tenino, WA 98589. For more information, go to scattercreekwinery.com.